Our nephew and nieces were over for the weekend; on the way home from the grocery store my nephew pulled out one of Aaron’s Alberta Outdoorsman magazines from the seat pocket in front of him and started thumbing through it. He proudly announced, “I’m going to read Uncle’s hunting magazine!” The day before he said, “Remember when Uncle and I went ice fishing, just the two of us?! ?…that was a great day!” When he left to go home, he happily told me that the next time he was over when Uncle was home they were going to “shoot his bow and BB gun!” It got me thinking about our next generation of outdoorsmen/outdoorswomen. We are very fortunate to have the kids in our family interested in our hobbies and that they genuinely enjoy them. From the beginning the kids were exposed to hunting and fishing; they have become increasingly more interested and involved. As a teacher, I’m always excited and impressed when my students show me photos from their hunting and fishing adventures. “Kids want their wildhoods back. They want to play not have playdates. Get dirty not sanitized. This definitely sums up our philosophy and the experiences we want our nieces, nephew and my students to have. Even if they decide in the future they don’t want to hunt and fish I hope that they continue to enjoy the great outdoors and nature in a capacity that best suits them (camping, hiking, rock climbing, gardening, canoeing, etc.). 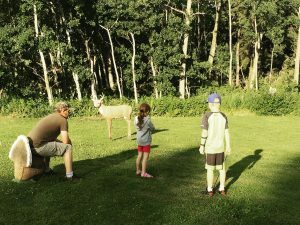 One place where kids can experience their “wildhoods,” in Alberta is at Alford Lake Conservation Education Centre. I have known many youth who have attended this facility and they LOVED it. They were able to take part in centrefire rifle and black power shooting as well as archery. Some of the kids learned the basics of crossbow and fly-fishing when they attended the camp. In addition, at Alford Lake, youth learn about small game hunting, pest control and trapping. After learning how to safely operate shotguns kids can test their aim at trap shooting. Survival skills and geocaching treks are also part of the experience there. There are waterfowl, whitetail, butchery and re-loading sessions as well. I wish that I had had an opportunity to attend something like this when I was in school. I came across an awesome post on www.wideopenspace.com while I was researching. It was called 10 Reasons to Teach Children to Hunt; I highly recommend you read it in full. A few points really jumped out at me. According to this post the number one reason is “Bonding Time.” When I watch Aaron with the kids; teaching Tristyn to duck call, teaching Keaton how to hit the kill spot on the deer decoy with his new bow or teaching Keira how to safely handle a firearm, of course makes my heart melt because it is not only ridiculously adorable but because I know that they strengthening their relationships; they are growing closer and closer. The time Aaron and I spend with them (not the stuff we give them) is what matters most in this life and they are beginning to understand this, even at this young age and they do crave the time we spend with them in this capacity. The second reason the post discusses is, “Tradition;” the kids have become accustomed to the routines in our lives. They know the seasons for hunting and fishing. They know that in July and August we set up the game cameras (they change out the batteries, go along for walks to retrieve and set them out, they get excited when Aaron shows them the deer pictures). They know that in September and October we are scouting for birds and they eagerly look out the windows when they come with us. They know that in November, uncle is sporting his hunting beard and lucky hoodie. They know where the best spots on the lake are for catching Walleye. They know that every time they come out they get to be ‘outdoorsman/ outdoorswomen.’ They seem to want to grow up to be like their Uncle Aaron; so maybe one day when they have their own nieces and nephews or children; they will pass on the knowledge and skills that we have taught them. Outdoor pursuits such as hunting and fishing are important for conservation. And being an ethical hunter and fisher are vital. The post from wideopenspaces.com lists learning “Conservation” as number three. Wanting to emulate her brother, Tristyn also grabbed one of Aaron’s hunting magazines. In the rear-view mirror I saw Keaton explaining the difference between an elk and deer to her, telling her what types of fish were in the advertisements. She turned a page and gasped. I asked her what was wrong. Keaton answered for her; he said it was a picture of snared coyotes. He then explained to his sister about coyotes and why people set out snares for them. At their young ages they know why some fish cannot be kept and why you can only keep a certain number of others. 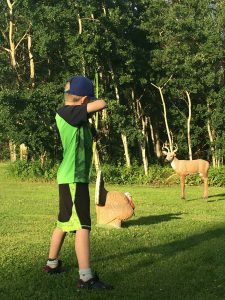 Numbers eight and nine are “Teaching Responsibility” and “Building Confidence,” and they go hand in hand –taking on responsibility, being considered mature enough to take part in hunting and other outdoor activities increases confidence. It is one thing to tell kids to be responsible or what it means to be responsible it is another to take part in a real-life activity where kids are shown and then have to demonstrate responsibility. I am confident that our nieces and nephew will grow up to not only be ethical outdoorsmen and outdoorswomen but good people who know that all things and people are deserving of respect. As a teacher I have unfortunately seen the causes of and the effects of low self-esteem in youth. 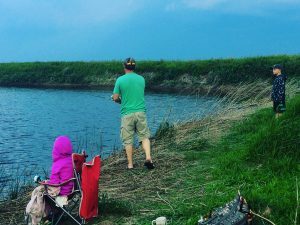 Fostering the next generation of outdoorsman and outdoorswomen may help to alleviate some of these issues. Not only will our nieces and nephew be surrounded by an incredible community of supportive hunters and fishers, but they will have a hobby that gets them off the couch and out in nature; and they can take pride in harvesting their animals and feel a sense of worth because they have provided food for our family. In closing, let’s celebrate and encourage our next generation of outdoorsmen and outdoorswomen. Let’s bond with them, let’s teach them, and let’s help them grow into responsible, ethical and confident people.